This album was re-mastered in 2012 and the song “Lately” was totally re-mixed from scratch. 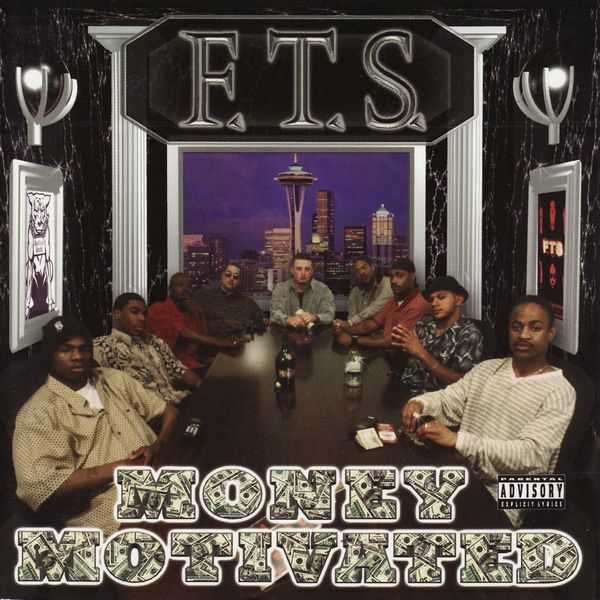 Seattle rap group, “F.T.S.” (Full Time Soldiers), was formed in 1996 when mutual friends introduced D-Sane to a pair of rappers named Smoke Dog & J-Dub. F.T.S. was originally a 3 man group, with D-Sane not only being an MC, but also handling the producer, DJ and recording engineer roles as well. Not long after, the trio would meet rappers Villain and Drama, drafting them into the squad. Soon, BD (or Brokedown originally) would emerge from prison to join the group as well, making a total of 6 members. Their early 4-track recordings from 1997 sprawled into what would later become known as the “Keep it Real” CD and was widely distributed amongst friends throughout the Puget Sound area. As bootleg copies of their material started to circulate, people became hooked on this new Seattle sound that featured spitfire lyrics and hard-hitting production from then seasoned beatsmith, D-Sane. After receiving large amounts of positive feedback from fans hungry for more, the label and artists decided it was time to put out a real album. In early 1998, F.T.S. began working on their debut self-titled album “Full Time Soldiers.” During this time, Brazy-J came into the mix, putting the group at 7 members. Unfortunately not long after, personal disagreements between D-Sane, Smoke Dog & Brazy-J would have D-Sane removing the 2 from the group and involvement in the project. Hence the reason they were absent from the debut album. Around this same time, D-Sane received an odd voicemail on his pager of somebody playing music with a dope MC rapping about Seattle. He eventually discovered the anonymous voice belonged to none other than their neighborhood homie Madd Dogg, immediately drafting him into the group and once again bringing the total to 6 members. F.T.S. was already partially into the recording of the album, but managed to get Madd Dogg onto several songs and redo some photography for the cover. Madd Dogg is not featured in any other pics because he wasn’t a member at the time of the initial photo shoot. In August 1998, D-Sane formally started Street Level Records and F.T.S. went on to release their debut album, gaining an incredible buzz in the Puget Sound area and selling over 1,000 copies. For a fledgling indie label and group, it was a major accomplishment. This was confirmed when SLR & F.T.S received their first national media attention by being named in the Rap Sheet Magazine 1998 Regional Round–Up as one of the few Seattle groups to “shake things up.” Around the same time, Villain opted to leave the group for reasons unknown and F.T.S. was once again 5 members. Following the success of their first album, F.T.S. expanded the group roster by drafting Byrdie & YG Red. D-Sane would also reconcile with Smoke Dog & Brazy-J, bring them back into the group for a total of 9 artists. They immediately went to work on a follow-up album entitled “Money Motivated,” which was released in March of 2000. Demand for the new album was so great, Sam Goody stores were taking reservations several months prior to it’s release, a first for any Seattle based Hip-Hop group or record label. The single’s “Player’s Policy” and “Lately” received heavy rotation on KUBE 93’s “Future Flavors” show. Phone lines lit up and requests poured in as F.T.S. started their invasion into the world of mainstream music. The massive amounts of radio feedback garnered F.T.S. a spot at the 2000 KUBE 93 Pre-Summer Jam Party where they literally stole the show and left a club full of people screaming for more. “Money Motivated” remains one of the best selling Seattle Hip-Hop albums available in stores to date. F.T.S. went on to dominate cyberspace by taking over MP3.com and securing it’s position at the top of the West Coast charts for 3 years, receiving more than 500,000 downloads and beating out household names such as Snoop Dogg. After selling thousands of units and rockin’ shows all over the NW, the crew disbanded in late 2001 due to internal conflicts between various members of the group, but the classic music that was created lives on many years after it’s release and is among some of the most sought after underground Seattle Hip-Hop ever created!! F.T.S. spawned the solo careers of Byrdie, Smoke of F.T.S. and Greedy BD aka Byron Douglas who have all released projects since their departure from Street Level Records. 16. Why You Do Me So Cold?